I shared recently that I am expecting baby #3 in July and this pregnancy I really wanted to add in a weekly yoga routine in my workout regime. I am a newbie to yoga but I instantly loved it thanks to We Heart Yoga Prenatal Flow with Jessica James. Jessica James lives in Malibu, CA with her two children and is known in Hollywood as the celebrity's secret weapon. She is a yoga alliance certified teacher, having practiced yoga for over 12 years. Her celebrity clientele includes Jessica Alba, Kate Beckinsale and Perez Hilton. At eight months pregnant, yoga expert and celebrity trainer, Jessica James, guides viewers through 3 complete yoga sequences that will get moms-to-be in pregnancy shape. 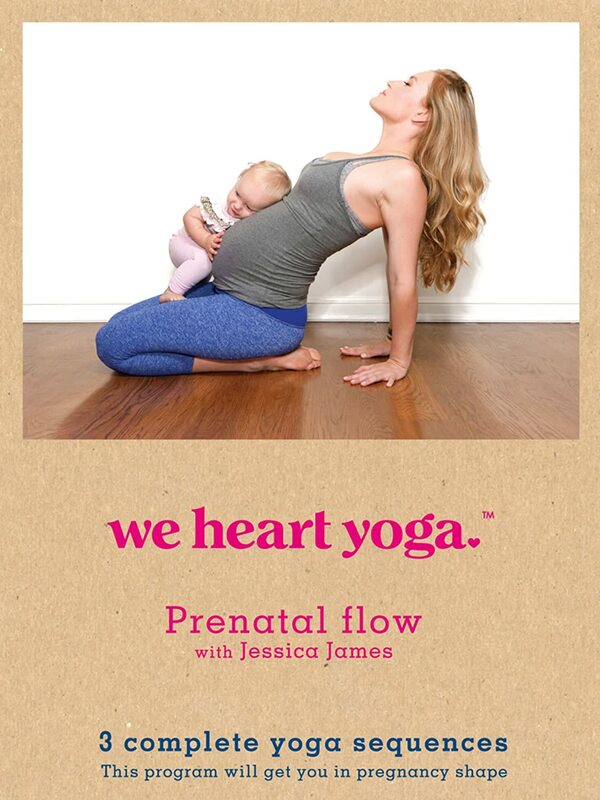 Jessica has created this real world yoga flow program that was born out of her own experience as a pregnant yogi. Already a mom of one child, Jessica knew she needed yoga to prepare for the birth of her second child. This DVD addresses the challenges and changes during pregnancy. Jessica does the entire workout with detailed and soothing voice over instruction set to the original music score produced by Dr. Luke and Cirkuit. The DVD includes an introduction to explain the terminology used, and what to expect from each different workout section; a cardio set designed with a quick warm up to burn calories and incorporate simple stretches when time is limited or energy is low; a full body set that is focused on stabilization and breath work and gets the body ready for all of the pregnancy changes; & a full body workout that is designed to strengthen the lower back and shoulders which is needed to support the additional weight gained during pregnancy & concludes with deep and relaxing stretches and guided meditation that sends light and love to the baby. I love that Jessica offers three different timed workouts and each one is so relaxing, challenging, and safe for my body and baby throughout my pregnancy! I feel strong and at peace after every workout...and I really look forward to doing my weekly yoga workout with Jessica James!